The recent earthquake in Napa, California is a reminder that seismic activity can occur at any time and cause considerable damage. The magnitude-6 quake hit at 3:20 a.m. on a Sunday morning. Damage is currently estimated at $1 billion – a harsh economic hit for an area with a population estimated at less than 150,000. Some predict that figure will increase to as much as $4 billion. Approximately 50 buildings were red-tagged, and 100 building were yellow-tagged due to quake damage. It was the biggest quake to strike the Bay Area since the 6.9 Loma Prieta quake in 1989. The Loma Prieta earthquake was responsible for the deaths of 63 people and over 3,700 injuries. Many of the structures damaged in Napa were masonry buildings. Thirty years ago California adopted a law to encourage earthquake retrofitting of old buildings. However, thousands of buildings have still not been upgraded. Has your home been retrofitted for an earthquake? Seismic activity occurs only a daily basis in California. Within the past 8 months, there have been four moderate to large quakes ranging in magnitude from 4.4 to 6.8., two of which occurred in Southern California. Earthquake retrofitting increases a structure’s ability to withstand seismic activity, including ground motion and ground failure. During a quake, ground motion is caused by the release of energy that occurs when the rocks on a fault move or “slip.” The motion is measured based on the duration of the quake, frequency of the shaking, ground motion velocity and acceleration. Ground motion from an earthquake will usually have little impact on you when you are outdoors in an open area. Homes and other structures however, can be severely damaged by ground motion. Ground motion is considered strong when it occurs 30 miles from the fault. Ground failure (also called soil failure) occurs when the soil a structure is built on is weak. Sandy and silt soil are weak soils that can start to sink during a quake. Liquification is a type of sinking that typically occurs when ground water is less than 30 feet from the surface. The seismic waves simply force the sand grains apart, causing the ground to become semi-solid. There are several factors that determine whether or not liquification will occur during a quake, including the strength and location of the quake, where the water table is located and the grain size of the soil. Not only can soil cause foundation sinking, it can also escalate the severity of the seismic wave. Some of the ways homes are retrofitted include foundation bolting, bracing and adding brackets. The purpose of the retrofitting is to minimize damage from a quake and make the building safer for occupants. A cripple wall is the wall between the floor and foundation. It can be only a few inches in height or several feet tall. When a cripple wall collapses during a quake, the floor drops to the ground. Bolting involves reinforcing the connection between wooden frames and concrete foundations. 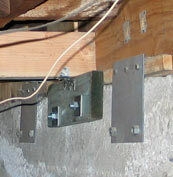 The bolts go through the wood and are attached to the foundation’s surface. Homes that haven’t been retrofitted can slide off their foundation and overturn. Cripple walls can also buckle and collapse, at the least creating the need for expensive foundation repair. To find out if your home is ready for the next big quake, contact a foundation specialist. Experienced foundation contractors can inspect your home and create a retrofitting plan to make your house safer. Earthquake preparedness can save you your home.